The relationship between the value of the Australian dollar and the trading volumes in USD terms is linear. The Australian Foreign Exchange Committee has released its latest survey data about the trends on the Australian foreign exchange market. The study encompasses data from from 24 financial institutions that are actively participating in the Australian foreign exchange market. Looking at the trends in total volumes, the figures in Australia are rebounding, albeit mildly. The total average daily volumes (ADV) across all over-the-counter (OTC) markets amounted to $134.8 billion in April 2016, when the survey data was collected. This marks a year-on-year increase of 3 per cent, but a decline when compared to the previous survey’s data in October. Looking at specific segments, that include FX spot, FX forwards and FX swaps deals, the turnover in the Australian market totaled $130.4 billion, while OTC options and currency swaps accounted for $4.3 billion. 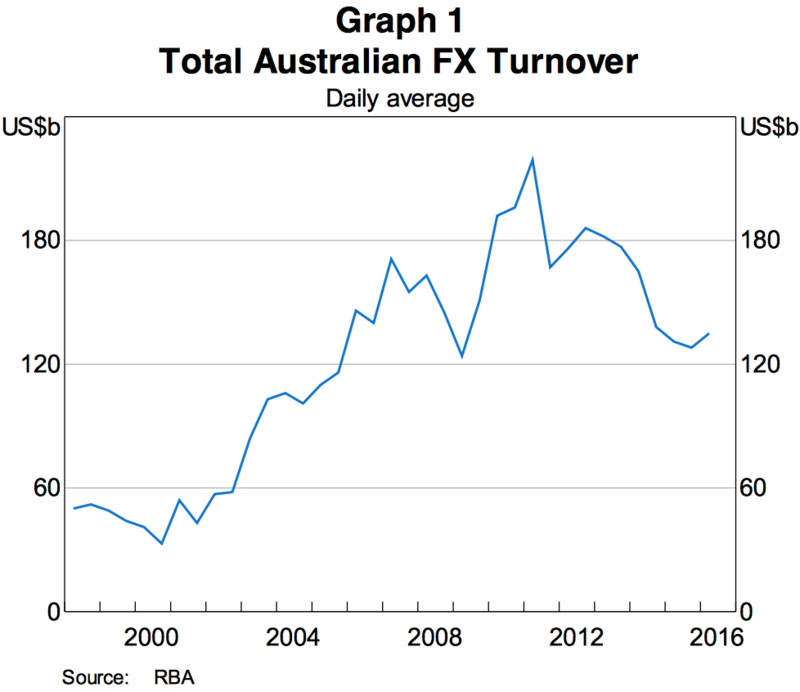 Since the majority of the turnover on the Australian foreign exchange market is conducted in Australian dollars, the total volumes numbers are affected by the value of the exchange rate of the AUD. Spot transactions on the Australian market have continued declining reflective of the changing product mix which is used globally. Peaking in the aftermath of the global financial crisis in 2009, the volumes in Spot FX trading have now almost halved. 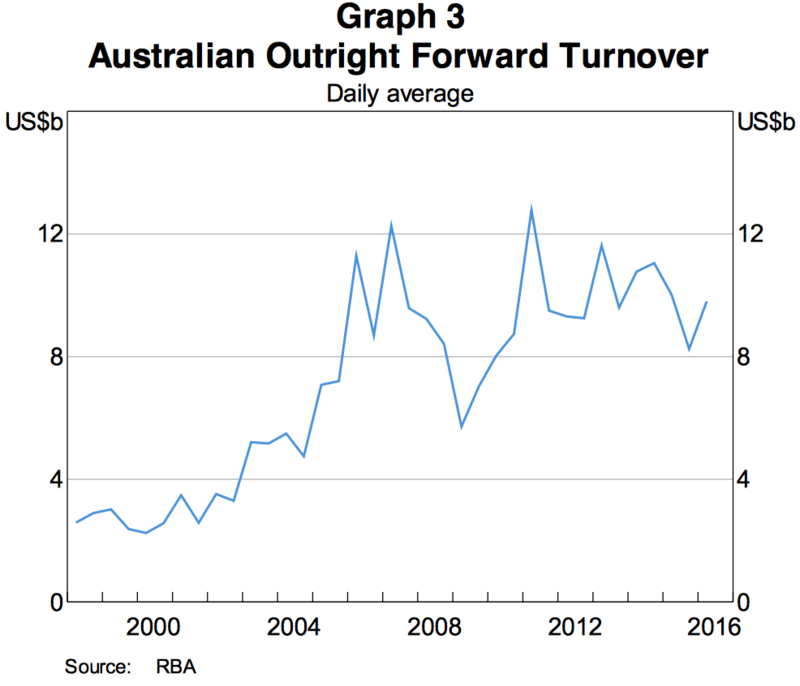 Forwards have remained steady with the total turnover increasing materially in percentage terms to just below $10 billion daily. The trend here is clearly reversing and we expect this momentum to continue into the next survey, the data for which will be collected in October 2016. 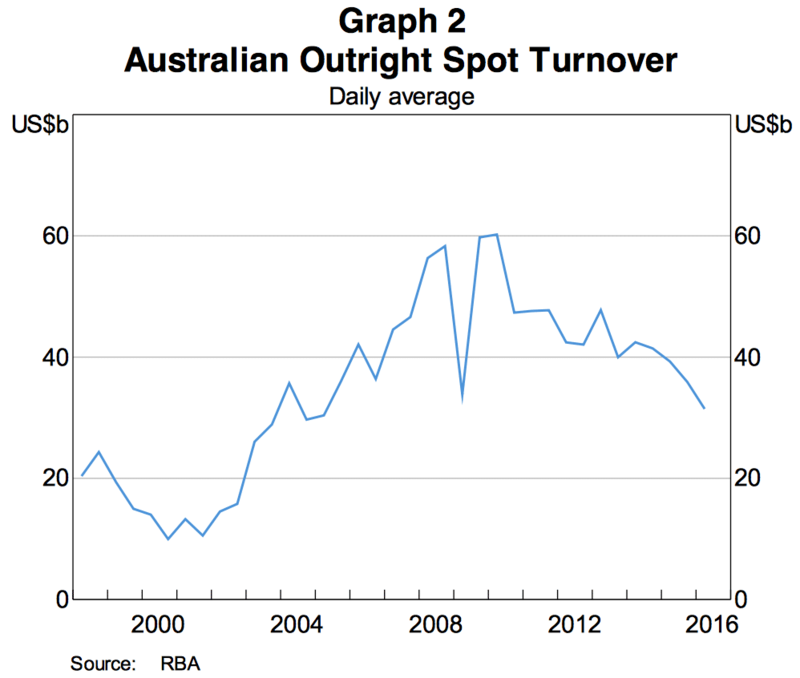 In recent months, the relatively steady performance of the Australian currency has assisted the plateau in the declining trend which we have been observing since 2011. 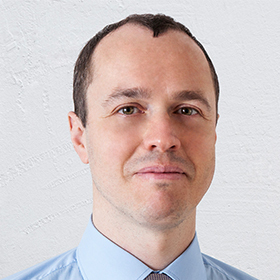 With the value of the currency declining in tandem with commodities prices, the effects of the currency rate have been materially reflected in the data. Looking ahead, the future flows are highly dependent on the actions of global policy makers. With the U.S. Fed on hold and the Reserve Bank of Australia contemplating additional easing in the coming quarters, the value of the ADV could decline in the next six months. Any slowdown in the U.S. however should have the opposite effect on the chart.